In 2013 Kellan MacInnes launched his book, Caleb's List. This is an engaging book about Caleb George Cash, a member of the Cairngorm Club and Royal Geographical Society round the turn of the 20th century. Back in 1899 he published a list of hills visible from Arthur's Seat. MacInnes christened them 'the Arthurs'. There's twenty of them. 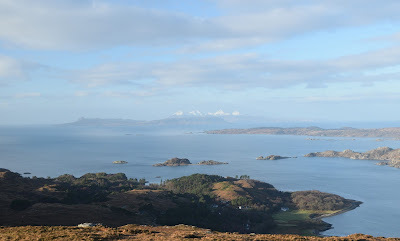 As many are Munros, I realised at the book launch that I had already done most of them. Chris Highcock had the same thought, but he actually climbed the remainder, becoming only the second Arthurist on record. The Arthurs are an eccentric list because Caleb, bless him, chose to only list hills visible to the north of Arthur's Seat. No Pentlands, Moorfoots or Berwick Law for him! There are those who would salute such latitude blindness. For me, I was intrigued by which hills remained so that I could say I had bagged them all. 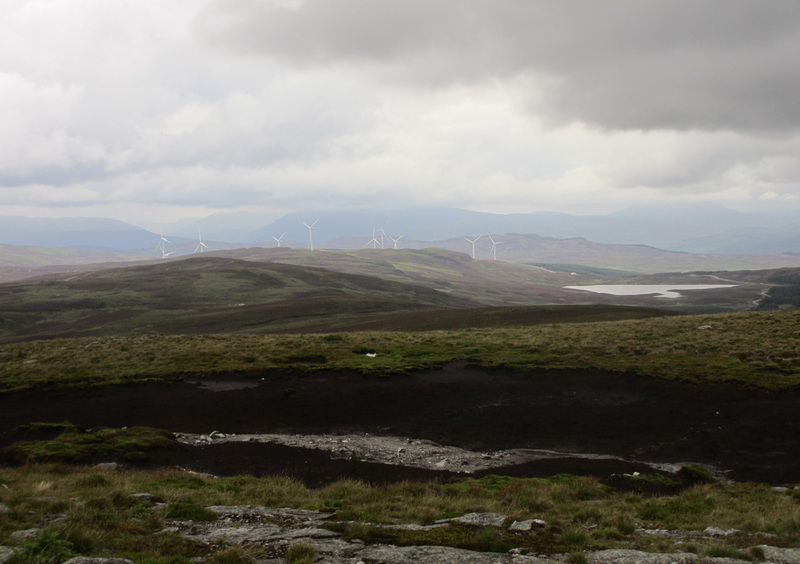 And so, this month, I came to my last Arthur - Meall Dearg. 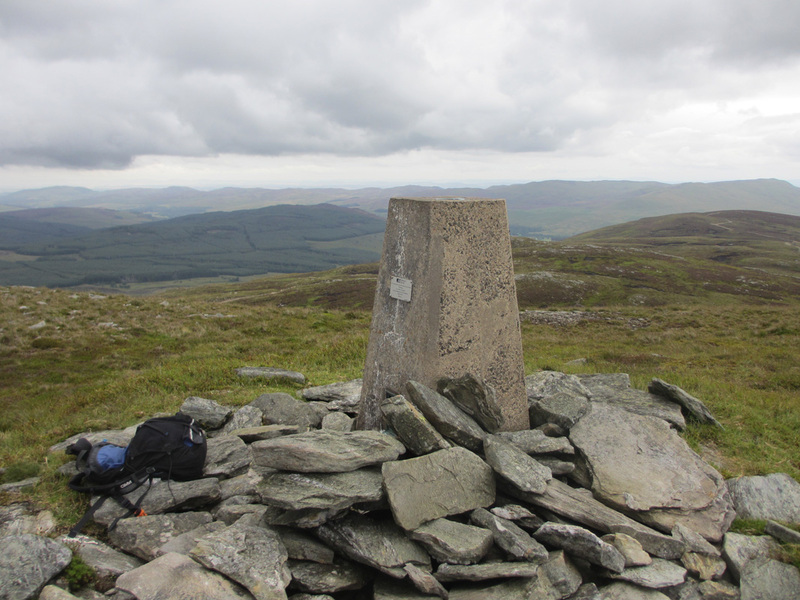 This is an obscure 690m high Graham in the ill-frequented (by hillwalkers) wedge of Perthshire between Crieff, Dunkeld and Shiehallion. The area includes Farragon Hill, newly-discovered Marilyn Creag na Criche, and a couple of windfarms. Oh and tussocky heather and bracken - quite a lot of it. We parked at an estate track just before the bridge on the A826. Once off the track, the way up bashes through luxuriant vegetation, plenty of lingonberries and blaeberries, not quite as sweet-tasting as they will be in a month's time. Dank trickles of water hidden under heather. Peat hags on the summit plateau. Sheep, frogs, hares, caterpillars, and a deer hind by herself. The trig point hoved into view and I touched it. Woo hoo! I was an Arthurist. We had gone straight up from the road, but on the top it was clear there was another way down. 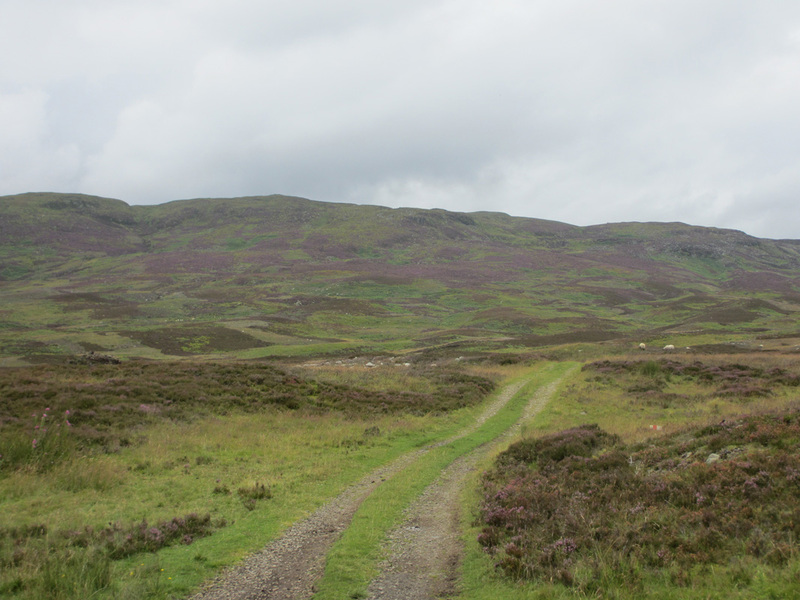 A new track, not marked on the map, goes close by the summit and links up with General Wade's military road to the north-east. We took this down and made a circuit. Here, for your delectation, is Caleb's complete list. How many have you done? 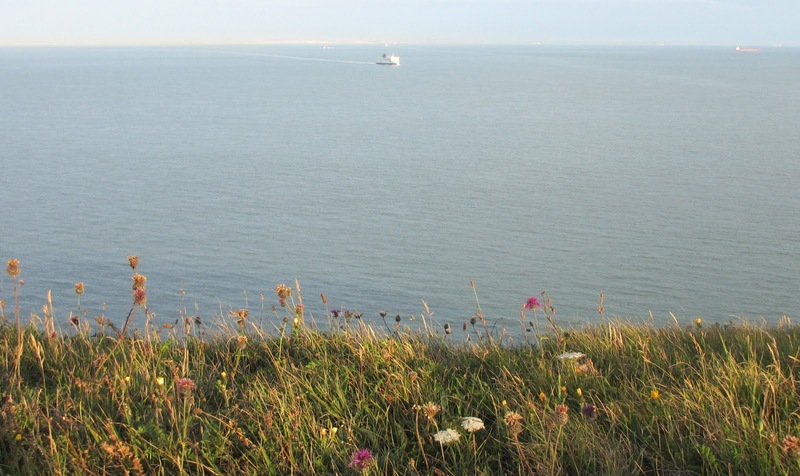 At the farthest end of Britain from Scotland are the white cliffs of Dover. 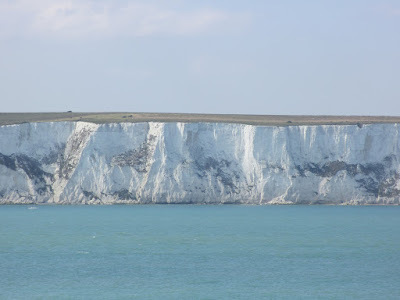 There may seem to be no connection between Dover and Scotland, yet I can think of at least two. 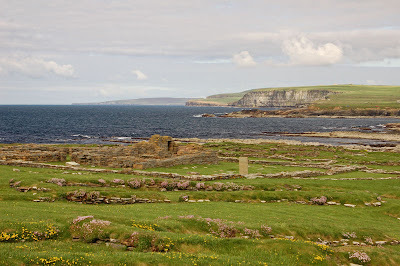 The first concerns the oldest known name of the island of Britain. In the north, it was Alba. In the south, Albion, effectively a variant of the same word. An argument has been made that this comes from an old Indo-European root word alb-, meaning white - the same root word that named the Alps and Albania. Why would Britain be described thus? 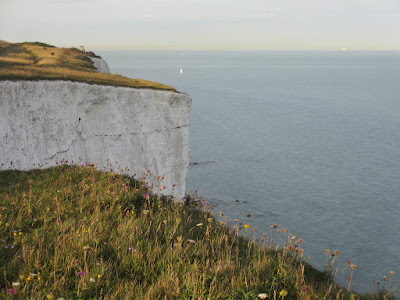 Some say that the name came from people who sailed across the narrowest point of the Channel from proto-Gaul, saw the white cliffs of Dover, and like European explorers of the 18th century in the New World and Australia, named the entire island after the first thing they saw. Alba, then, used to describe the whole of Britain - today, in Gaelic and Welsh, it is used only for Scotland. Wouldn't it be ironic if Scotland was named after a geographical feature at the farther end of Britain? The second connection concerns the movements of Scottish armies. It is a little known fact that in 1216, Alexander II invaded England as far south as Dover - the furthest south an army led by a Scottish monarch has penetrated. He did so to support Prince Louis of France as heir to the English throne in the aftermath of King John's dispute with his Barons' over 1215's Magna Carta. 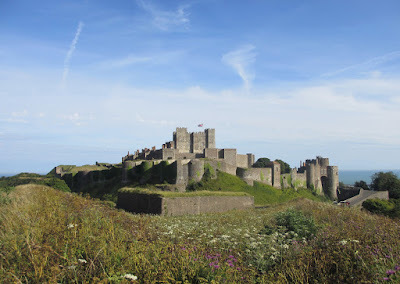 Louis had the support of most of the Barons, but was having trouble reducing Dover Castle, which was being stoutly defended by Hugh de Burgh. This immensely impressive castle, the largest in England, is perched in a strong position on top of the white cliffs and a great prize for any who held it. Hugh refused to surrender 'the key to England' to a foreigner. But before the siege was resolved, John did England the favour of dying on 9 October 1216. His 9-year old son Henry III was persuaded to agree to Magna Carta and put under the guardianship of Hugh de Burgh, and the Barons saw Louis off, now that he was no longer needed to rescue them from a useless king. Nowadays Dover is a run-down town, a poor advertisement for anyone arriving from the Continent. But the cliffs remain, providing a unique and beautiful walk along an historic coast. 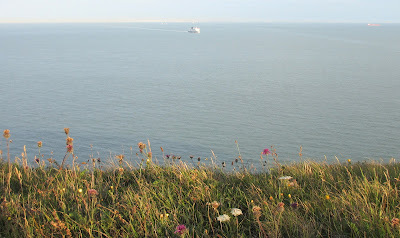 On the edge, wild flowers grow and Europe can be seen in clear weather. On seeing France the mind wanders unbidden to Napoleon's thwarted invasions or the desperate fights of the Battle of Britain in 1940. In such a mood, the Channel is nothing less than Dover Castle's 21-mile wide moat, sometimes all that has held invading hordes at bay. With illegal immigration the latest moral panic, the whole of today's UK seems to narrow to this one fretful point.